How can I tech simple songs to beginers and learn more my selfe. What I know is Ro Ro Ro your boat and where the keys are. What I learned was mary had a little lamb, All of me, Londen brideges, Happy birthday to you, Twwncle twencle Star. What I want to know is more songs. The action I will take is make a web sit on it it will have me teaching on it. I am going to watch youtube and go to sites. Can I still learn the rest of all of me. Reflection: I Learned new songs like Happy birth day. What was hard was teaching the songs. The most fun was playing all the songs for all the peoples. The most easy was putting the videos of me on my website. The thing I will do differently is probably learn more songs. What Advise I can give to others is learn as many songs as you can. What Can I Learn By Performing Different Science Experiments? By: Stacy D.
All science experiments have a science behind it. Science experiments can make sounds, can explode, erupt, steam, etc..
Science Experiments are very fun to do. Science experiments can be done at school in science class. Science experiments can be very fun but you can have fun by teaching them to other people as well. Science experiments can surprisingly eaten. You can create things by doing science experiments. Why science experiments are mostly taught in school and not so frequently at home. What I can learn by performing different science experiments. Tell my friends and family what I have learned. Make a family time when me and my family can do various experiments. Ask many questions to the people I know. Go on the internet and learn all the information I need to know. 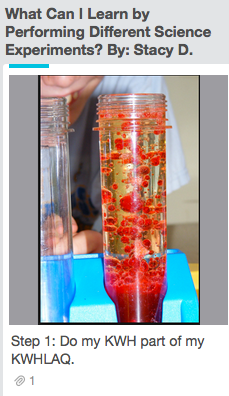 Read teacher blogs if possible and learn how they use science experiments in their class. Watch YouTube videos online and learn from people with experience. Who discovered the very first science experiment? What kind of experiment is most likely to be a favorite? Do most fifth graders do experiments? Do people seem to enjoy science experiments? I had a really great time doing this project because It was not just fun, but I learned a lot as well. I performed various different experiments which made my project even more fun and resourceful. I thought that I got a lot of work done everyday and all of the time I had was very valuable. 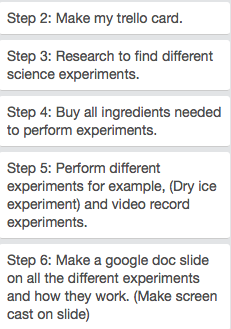 In this time, I made a google slide giving the directions to various different science experiments. The slides provide the science behind each experiment as well. There is a science behind everything! When I first started this project, a girl came up to me and said, "Now I want to do your project!" This made me really happy because I knew that people have the same interests as me and they are really interested in what I am learning about. Even during the weekend I bothered my parents in doing experiments. For example, I did an experiment that I found in a science experiment book. In this project, me and my family made a video of us doing it together and we had a really great time. This was a great passion time project for many reasons. 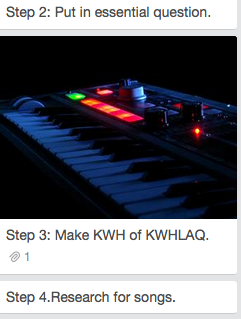 I even learned that people wished they joined me in my project too. I had a blast doing this! very hard when they do their work. They also have a lot of tools like a mouth mirier so they can see cavities. I also know that you have two layers of teeth your baby teeth witch are starter teeth, and you adult teeth. Your adult teeth never fall out from natural causes. W. I want to know what the different tipes of stuff they do are, like how do they put in fake teeth or how do they know when somebody has a cavity because that might be hard to see sometimes. Also I want to know how the picture thing works. I also want to know how they drill out cavity's. H.I will go to websites and see the tipes of tools and what they do and how they help tool cavity. I will also look at a dentist's things and mainly just info about what they do and how. I will also find out the different layers of the tooth from a site. L.I learned that dentist do a lot of work and they can use a lot of tules. They also have very good focus and they do a lot of xrays. I also learned that the dentist uses a picture in the mouth to put it on a computer and Annaliese what is wrong with somebody teeth, and if there is a cavity they drill it out or if it is a very bad tooth they pull it out. I also learned that there are Manny layers of the tooth and that the tooth is like a tree it has roots that connect the tooth to your mouth. A.I will add to my site to make it better and I will show it to people. 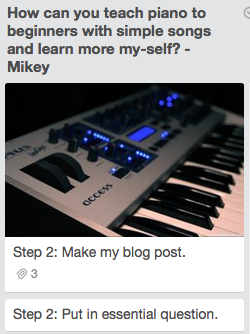 I will also ask people what they like about my site and what they suggest what I should do for it. I will also come back to it when I have extra time during Passion time if I finish a topic early. Q.How do dentist find were they work and how do they remove teeth, Also I want to know how they put in fake teeth and if it matters how big a fake tooth is. I also want to know how dentist fill in the holes they put in the teeth and what it is made of. I really liked this project and one of the things I liked about it was seeing some of the videos of dentists working and I like reading about the different tools that a dentist works with because, it is cool for me to see how dentists work. One of the hard tings was finding info because I kept have to go to different sites because it was a dentist's office site. The main reason I picked this id because two of my cousins who are brothers have a dentist business and they have like 4 different offices. Using a tournament bracket, can I determine my favorite style of art and recreate it? 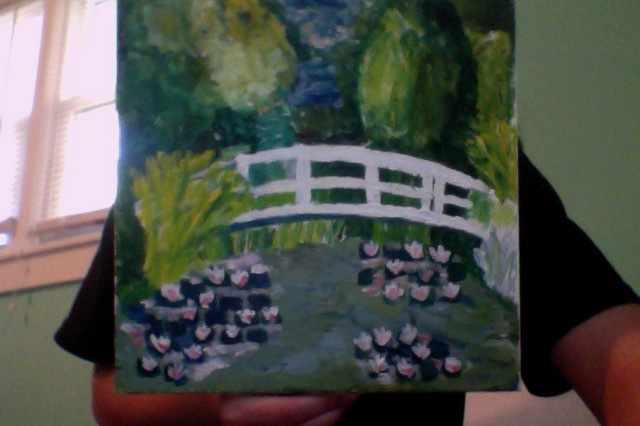 By: Kendall F.
This is the painting I made for my project! It is a recreation of Claude Monet's Water Lily Pond. I learned a lot about painting while doing this project. I found out that I like impressionist paintings because the colors mix together when you look at them. Next time, I would try and see why people chose to paint in certain styles. Painting is really fun because you can express yourself. I had a lot of fun learning about artists and what their paintings represented. I also had fun trying different styles of painting. When I learned about different artists, it was hard to understand their style of painting until I really got into it and learned a lot about it. I'm glad that I learned about different styles of painting because now I know what styles I like to use when I paint. I will also try and incorporate some of the techniques I learned into my own work. Overall, I had a lot of fun doing this project because I was really passionate about my topic! Can I compare and contrast some of the fastest cars in the world? By Hasanain. K.I know most of the fastest cars aren't street legal. I also know that they all cost a lot of money. I also know that the Ferrari is one of the popular cars. W. I want to know what car I should bye if I had 1 million dollars. Also what is the best car? H. I am going to do this by reteaching. also finding facts about the car's. L. I have learned that If I get allot of money and i want one of the fastest car in the world I should go with the Hennessy Venom GT. I should go with that car because it is faster the the Bugatti and it is cheaper that the Bugatti. Q. My new question is can I create a model of a car using information from pictures on the internet. I had allot of fun doing this project. The hardest part of this passion project was getting the information on the cars. One was so hard to get that I had to quit that venn diagram. 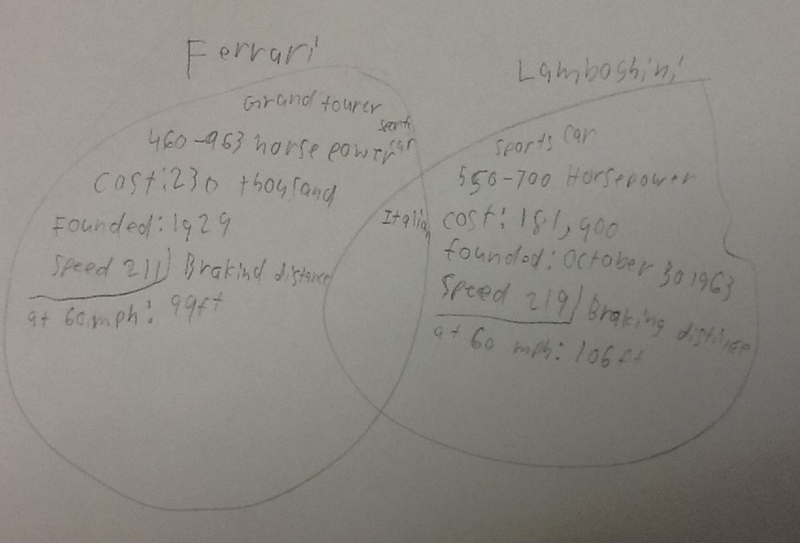 The easiest part of the project was making the venn diagram because you have the info so you make a side for the cars and just fut down the information that you had on it. 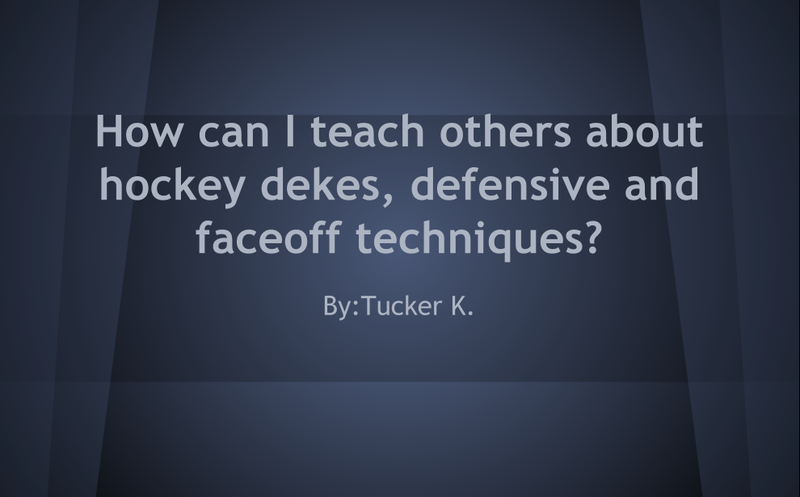 How can I teach others hockey dekes, defensive techniques, and face off techniques? By: Tucker K.
I learned a lot. I learned that you don't always have to do the coolest move in the world. A fancy move that doesn't work is not better than a bad and easy move that you get around. I will show other people what I learned and teach hockey stuff to the people in the world. I want to find out by researching on computers and videos for moves to execute. I have many questions. For example Who is the fastest stick handler and stats like that. I learned a lot. Like different shootout moves and moves. What was the most fun was making the videos and doing the dekes. What was difficult was coming up with what moves to do. 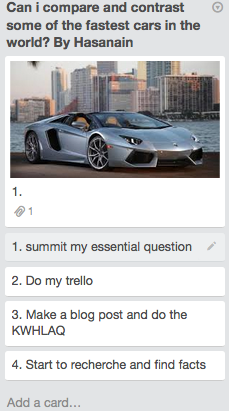 What was easy was making the presentation and the trello. It was easy because I was a pro at them both. I would do some big and easy moves to do. I would say come up with more moves and just do the easy stuff first then the hard stuff. We know the game Minecraft and play it. I know some parts of the newer updates but not all. We have learned what Minecraft's evolution is and how it can be used as an educational game. We want to know the education and the updates. That's interesting to me and Id like to know. We will keep playing Minecraft and maybe edit our website. We will also keep experimenting and have fun playing it. We will research things that will help and make a website. What is the Nether and the End like (different dimensions in Minecraft), what other things can you do in those places, and what future updates will they make? I think the most fun things in this project were working with my friend Chris, and doing research about Minecraft! I love to play Minecraft and thought that it was awesome researching about it. I think the easiest part was writing what Minecraft is in my website because I've played it so I know most of the things about it. I would do something different next time though. I don't think I checked my work well enough so when I did my video, there where a couple flaws. I will check over my work really well next time though. This was a great passion time round. Which animals are most aggressive and what are the reasons? By: Nicole and Madi. They could have had a bad past. They could be naturally aggressive. What animals have the most aggression? Are animals more aggressive if they are in captivity? Seeing what there past was like and if it affected them. Elephants can kill entire villages. Whales in captivity can tend to have more aggression. Bears usually kill people in groups of six or less. Rhinos have bad eye sight. Hippos can run 18-30 miles an hour. 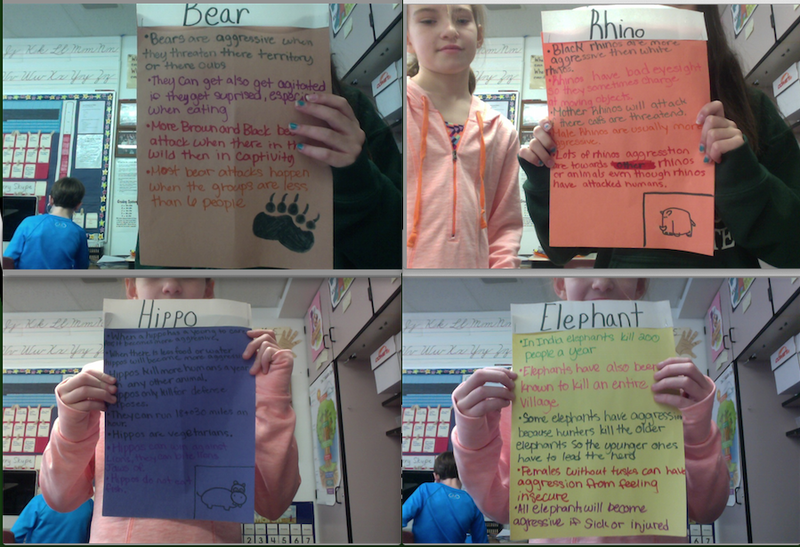 We made posters that explain why some animals are aggressive. We made a video that explains the animals and the posters. Are people still taking whales out of there homes and family and putting them in captivity? Why do rhinos have bad eye sight? How can hippos run so fast when they are so heavy? Why are bears in captivity less aggressive? I really enjoyed this round of passion time! I really enjoyed working with my partner Madi. This round Madi and I were working on a project about animals aggression. Our question was " Which animals are most aggressive and what are the reasons for it? " I learned lots of stuff. I learned stuff like how rhinos attack usually because they have bad eye sight and they charge at whatever they see. I also learned how elephants can destroy a whole village. I had lots of fun doing this round four project! I had a lot of fun doing this project. I think it was fun because I just wanted to learn about shamu but then expanded it to more animals which made it really enjoyable. I think the hardest part about this project was picking out the animals to research because I just didn't want to do animals everyone would think about like tigers, and lions. And some tips if you want to do this project are try to research hippos because there so fun to learn about and picks animals that you wouldn't think have aggression. How have legos changed and how can they be used in the class room? By: Charlie C.
K: I know that LEGOs can be used for many things. Also LEGOs are the number one best toy selling company in the world. L: I learned that LEGOs can be used for many things, that they were first made in Denmark, and that they were first made of wood. W: I want to know how they have evolved and how they can be used in the classroom. A: I will continue to research my topic and try to convince teachers to include LEGOs in the classroom. H: I will research my topic on the internet and by watching videos. I will then make a web site. Q: I want to know why LEGOs are so popular and why they are so expensive. This topic was very fun to do, I had a lot of fun making my website and researching my topic. Some of the harder things was finding facts and opinions about how LEGOs can be used for education, once I found a good site though it was pretty easy. It was very hard to create the time line because I could not find a good website about the history of LEGOs. Once I found the site though it was easy. One thing that surprised me was that LEGOs were first just wooden toys and that they got the interlocking bricks in the 1970's. This was overall a really fun project to do. How Does Volcanism Work? 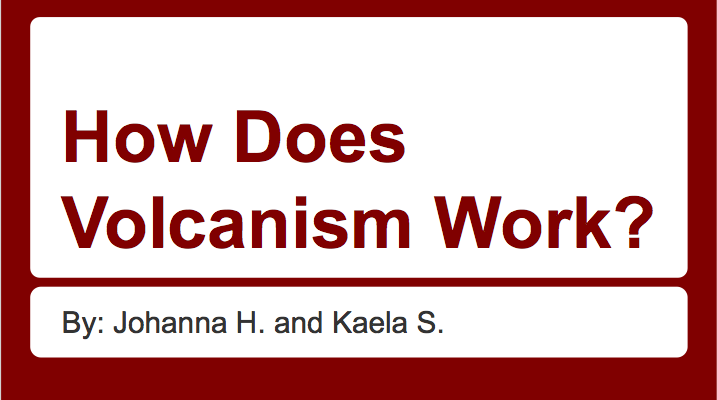 By Johanna H. and Kaela S.
I know that volcanism has a chamber inside a volcano. I also know that It forms when two plates collide. I want to know is how does the magma get into the volcano? Also which occurs the most, oozing or exploding? I will research videos online. I will go to different websites too. We learned that how you make a chamber is that when the gas chambers push up it blows then make a crater. We also learned that when the magma get's in the volcano gets the magma is from when the crust cracks and then the magma get's inside the volcano. I will tell my friends and family about this site. I will also tell my family about like what new things I found out. Some questions that I have is does it depend what type of volcano it is to determine the type of blow? Can liquid soap work with making a volcano better than hard hand soap? I learned that when the earth cracks exposing the magma the two plates collide creating a mountain and when the gas chambers underneath push and push suddenly blows creating a crater on top. And when those gas chambers push again but with the magma on top it erupts and blows either blowing up or oozing and then the lava comes out. The most fun about this project was doing the test experiments because it was fun seeing everything coming out but with the anticipation. The most difficult thing was trying to find the right amount of stuff to put in for example soap. It was easy painting the volcano and the box. I would instead try to plan ahead and try to use our time wisely and try to stay on task and not talk to my friends. My advice would be is try to stay on task cause I know it's fun and try your hardest. And I really enjoyed this round too. I really liked this project. It was fun because I learned about volcanoes working. 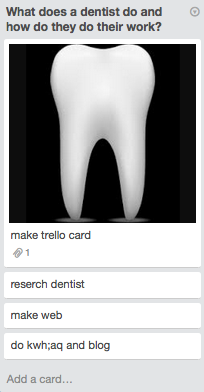 I wish that I would have looked at my trello card more because when we painted our box and we didn't look at our trello card. We should have checked it first. But I did like doing the experiment. I had a lot of fun cutting the soap! :-). I liked doing this with Kaela and I liked using Google Slides instead of making a website on Education Weebly. Now I want to do another experiment!!!! !